I drew Sleipnir because he's so nifty. I imagine he has a lovely turn radius! 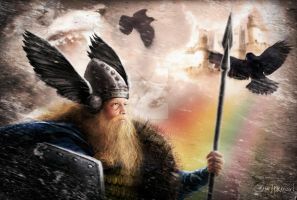 I'm sure I'm not the first one to ask this but: Have you heard the song titled Sleipnir by Manwar? Awesome picture of an amazing steed. I do know it! Manowar is such an awesomely cheesy metal band. I want to go see them another time before they decide they're too old to tour. ^_^. I've been wanting to go to one of their concerts for a while now. He is extremely interesting! I aught to delve back into Norse lore and start drawing more of it. Great job, I love how you managed to keep him looking graceful despite all those legs. I have featured your artwork at Mythical Creature Archive with credit back to you. If I misunderstood your permissions and you'd like me to take your art off the site, please contact me and I will take it off immediately. I don't want to steal anyone's art, just provide more exposure to artists. This aught to be fine! And thank you so much for that!!! Referencing is fine! Indeed, keep the cites with it! Thanks the compliment and asking!!! Very cool. 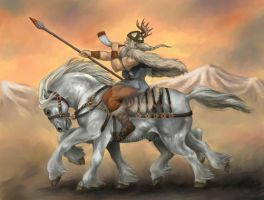 What a great rendering of Sleipnir! Only I just found out, that apparently he's white? Although all the images I've seen were black! Oh well! Actually, I think he's dapple grey? Anyway, the art is stunning. Not a big deal. You did a fanastic job with all the legs, not an easy task. Thank you! I used grey's book of anatomy to see and draw my skeleton first, that helped immensely. That I know so much mythology after not paying attention at all when it was taught to me. I pity that whole side of the family really... C_C Fortunately I grew up with with a completely different part. We're quite backwards.